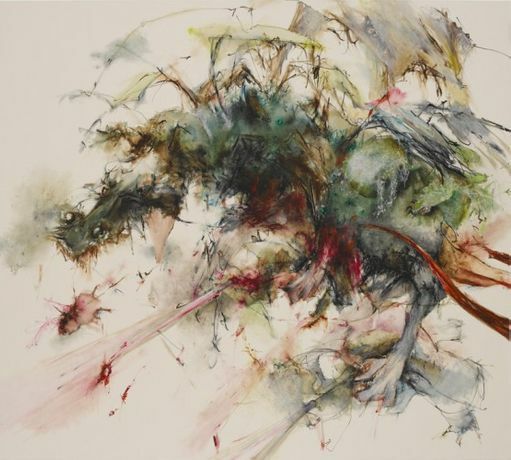 White Cube is pleased to present an exhibition of new paintings by Christine Ay Tjoe. One of the most acclaimed Indonesian artists, Ay Tjoe’s work has been widely exhibited throughout Asia. For this, her first exhibition in the UK, she has produced twelve paintings including two large-scale diptychs, the culmination of several series of work. Ay Tjoe began her career as a graphic artist exploring the intaglio dry point printing technique and then moved into working with textiles. Now encompassing painting on canvas, works on paper, sculpture and large, room-sized installations, her work focuses on the human condition as filtered through her own subjective experience, and addresses themes of philosophy and spirituality. Ay Tjoe’s paintings are often misunderstood, seen as being purely beautiful. Although they are visually seductive, they deal with abject subject matter, attempting to connect with our most powerful emotions and deep psychological fears. Using delicately applied oil bar, images can range from tentative or suggestive figurative forms to intense, dramatic passages of abstraction, frequently with large areas of the canvas left blank. The importance of drawing, in particular the line, was learnt from studying printmaking and is central to her work. In the new paintings, Ay Tjoe looks at our global, consumer age: its hyper-urbanity, density of population, information overload and inevitable greed and competitive drive. Colourful all-over compositions seem centrifugally driven, with visceral paint application expressing a sense of physical urgency. Strong, visible brushstrokes and erased or partially rubbed out areas of paint provide a sense of chaos and energy, as if beauty morphs into abjection and equilibrium dissolves into disharmony. Powerful emotions are suggested through the use of strong colours, with a predominance of earthy browns and blood red. Ay Tjoe’s choice of colour is always charged, relating to the idea of mind, body and soul and the essential balance between all three. Embracing the notion of physical and metaphysical levels within the works,figurative and partial animal protagonists or characters emerge ‘by accident’ from the painting process. Ay Tjoe has said that these forms are metaphors for figures of authority, suggesting powerful witnesses, figure heads or ‘gods’, all forces that influence and shape our behaviour. Christine Ay Tjoe was born in 1973 in Bandung, Indonesia, where she studied and continues to live and work. Her work has been exhibited across the Asia region, including a major retrospective at SongEun ArtSpace, Seoul (2015). Ay Tjoe has also been featured in group exhibitions around the world, including shows at National Taiwan Museum of Fine Arts, Taichung and Singapore Art Museum (2012); Fondazione Claudio Buziol, Venice and Saatchi Gallery, London (2011); Shanghai Contemporary (2010); National Gallery, Jakarta (2009); Johnson Museum of Art, Cornell University, Ithaca, New York (2005) and the Beijing International Art Biennale, China National Museum of Fine Art (2003).